BHC DIPA, a double IPA released by Ska Brewing (Durango, Colorado) is well-balanced, linking together the traditional hoppy, piney, and floral elements of an India Pale Ale with a bit of juiciness. By hitting both of these marks, Ska is able to make something that any fan of hop-forward beers can appreciate. With an 8% ABV, the specific array of flavors that have been imparted upon this brew are extraordinarily stable. For every bit of citrus that peeks through, bits of wheat and peach are present shortly after. We’re digging the bitterness of this one; Ska’s double IPA is hop-forward (75 IBU) without being a one-note brew. It’s this easy to approach and easy to drink spirit that makes it a treat during warm summer nights. 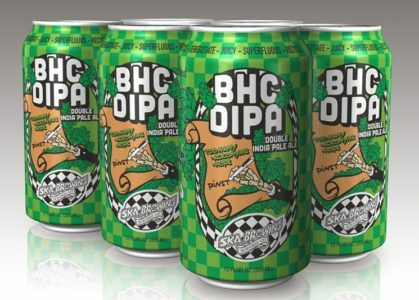 Ska’s BHC DIPA would be best paired with strongly-flavored fare. We’d recommend checking out the beer alongside Indian cuisine or barbecue. The brew is available in cans and on draft in Ska’s distribution footprint. For additional information about the full gamut of year-round and seasonal offerings from Ska Brewing, check out their main domain. News about upcoming beers and events can be found at their social media. If you find yourself in the Durango area, Ska’s World Headquarters offers tours at 4 PM on Mondays through Saturdays. Food options are available through most of the day.